The national flag in Sikkim was first adopted in 1877 after its contacts with the British and it has a history of its own. The flag of Sikkim had change its shape and colour according to the need of the hour. The flag pasted here is the youngest of all its predecessors which was adopted in 1967 and remained as a national flag of independent Sikkim till 1975. Before this, Sikkim had come across other three flags which were distinctly different from the last one. As stated earlier the first national flag was adopted in 1877 which remained up to 1914. With the accession of Maharaja Tashi Namgyal the former flag was send-off and a new flag was adopted. From 1962 till 1967, Sikkim adopted another banner as its national Flag which stayed for five years. 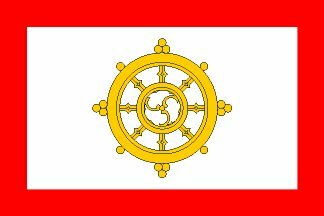 With the succession of Palden Thondup Namgyal Sikkim espoused this very emblem as its National Flag. Ten years ago, when Prince Palden Thondup Namygal was crowned Chogyal (King) of Sikkim, his young wife, Sarah Lawrence Graduate Hope Cooke, became "Queen of the Happy Valley" and "Consort of Deities." Together they pledged to make the tiny storybook kingdom "a paradise on earth." They also hoped to make Sikkim, an Indian protectorate since 1950, more economically and politically independent. That was a fairy tale not to be. Last week India's Parliament voted to make Sikkim India's 22nd state. It was the last act of a sequence that saw Sikkim's 300-year-old monarchy abolished, and the once internationally glamorous King and Queen of Sikkim become Mr. and Mrs. Namygal, citizens of India. The process of annexation actually began in April 1973, when the Chogyal asked Indian troops to help control demonstrators who were threatening to storm his palace in Gangtok. The riots stemmed from a controversy over the nation's electoral procedures—a system that inadequately represented the settlers from neighboring Nepal, who make up 75% of Sikkim's population of 210,000. India subdued the demonstrators —whom they may have instigated in the first place—and then pressured the Chogyal into accepting a constitutional agreement that virtually stripped him of all power. 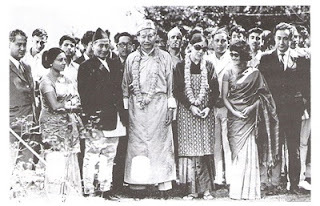 In elections supervised by India in April 1974, candidates from the anti-Chogyal, pro-India Sikkim National Congress party won 30 of 32 seats in the new Sikkim Assembly. According to the Indian tally, even areas that had solidly supported the Chogyal a year earlier voted overwhelmingly for his opposition. The newly elected Assembly's first act was to submit a resolution calling for closer ties with New Delhi. Three weeks ago, the Assembly voted to abolish the monarchy and merge completely with India. The Assembly hastily organized a referendum and within 72 hours announced that the people of Sikkim had voted to relinquish their sovereignty by the suspiciously top-heavy margin of 59,637 to 1,496. Although there was little debate before the act of union was rushed through India's Parliament last week, one opponent of the bill did charge India's Foreign Minister Y.B. Chavan with behaving like "a very apt pupil of the British." Prime Minister Indira Gandhi, who has repeatedly excoriated other nations for similar interventions, explained the annexation by simply observing that the people of Sikkim want it that way. Some observers argue, however, that New Delhi simply wanted to tighten its grip on an area it feels crucial to its defense. Sikkim is a buffer between India and Chinese-controlled Tibet. The final humiliation came to the former Chogyal, who is under house arrest, when security police searched his palace last week and confiscated his ham radio on the grounds that he was operating it without a license. Hope Namygal, who took refuge in Manhattan shortly after the 1973 uprising, says that she is "gravely concerned about the safety of the Chogyal and the many Sikkimese nationals who have tried to save their country's identity".